Adults are not always the wisest beings in a room – just get a group of young children together, children that don’t know one another, and observe what happens. Inevitably they will begin to interact with each other. The innocence of a child, the trust that is inherent in youth, will allow them to reach out to one another, striking up conversations and sharing stories. Effortlessly, they will connect with the other children in the room. It is through aging, ‘growing up’, that we squelch those urges to connect – to make friends easily – to stay in contact. Obligations take precedence. We tell ourselves our time is limited…chores, work, and "stuff"...they are all more important. But, are they really? Family. Friendships…a sense of belonging…a sense of community…these are important relationships that are good for our souls and our health. Significant studies have been done on the effects of loneliness on not only our psyche but on our physical heath. Without connections to others we feel alone, anxious, marginalized and depressed. One landmark study has shown that lack of social connections is a greater detriment to our health than obesity, smoking and high blood pressure. The Prime Minister of England, Theresa May, has gone to the length of appointing a Minister for Loneliness. With more than 9 million people in Britain reporting that they often or always feel lonely, Mrs. May is attacking the problem head-on through programs designed to foster a sense of community, a sense of belonging. Here, in the United States, health insurer Cigna, took a nationwide survey (in 2018) of 20,000 adults and found that 46% of respondents said that they feel a “lack companionship” and “isolated from others”. This is a significant issue. New parents, children, disabled, care-givers, refugees, and older adults are more prone to feeling isolated. Social media does little to alleviate the problem of feeling separate, alone. Human interaction, daily, even weekly, has shown to help with feelings of isolation. 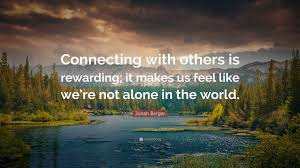 Strong social connections, relationships, encourage a sense of belonging. A sense of belonging allows us to experience growth, gain insight, and explore different ways of thinking, feeling, being, in an environment that is a safe. I began thinking about what a sense of community, being connected with others, means a few weeks ago. 2017 was a life altering year for my family, my Son had gotten critically ill (he is in recovery currently), and families that were part of my Son’s school, friends, neighbors, strangers even, were so supportive, that as I reflect upon that time, I am filled with an overwhelming sense of gratitude. I survived because of their compassion. My family and I were so very blessed when the holidays came – just 3 months after my Son’s homecoming – we had the love and support of so many looking in on us. What happens to those among us that do not have that support system? The holiday season is upon us. Is there someone, a neighbor, co-worker, a friend or relative that has distanced themselves? It is said that we make time for what we feel is important – make someone else important, a priority. 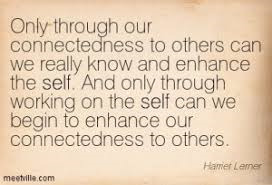 Take time to listen… to reach out… to make a connection. If you find that you are on the other end of the spectrum and you are the one feeling alone and isolated there are steps that you can take to rectify this. Call a friend or family member. Reach out. Seek out a club, organization, or church group to join. Being with like-minded individuals fosters a sense of community. Volunteer. Helping others is a wonderful way to connect with the outside world and is nourishing to our spirit. In my opinion, the holidays are so much more then decorations and shopping. They are a time, a season, of reflection…reflection on the past year, on where we are, on what we are planning on for the new year. Reflect upon the numerous blessings, large and small, you have experienced this year. As we begin this holiday season…let us share that gratitude by reaching out to one another, by making a connection, by lending an ear, a helping hand. Let your time and attention be your gift to someone. Go forth and show compassion and love … with your words and deeds let there be one less lonely soul.